A massive job, this one. 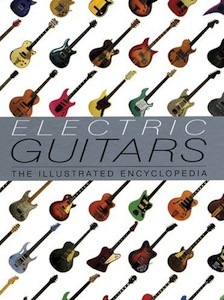 It’s an encyclopedia that covers … wait a minute while I count … 130 brands of electric guitars, from Acoustic (yes, this book on electric guitars starts with the Acoustic brand) to Zemaitis. Major brands get the full treatment, of course, with quite a few at some length, while the smaller brands are necessarily shorter. To see a list of all the brands covered in the book, click the link here. We published the original edition – see its jacket below here – back in 2000. In 2018, we revised and updated the book for a new edition, published by Chartwell, and that’s the jacket you can see on the left. Just now, as I opened my original copy of the book to count the number of brands inside, an old press release floated out. It has some further mind-numbing statistics that I know you’ll want to hear: 320 pages, over 1,200 photographs, including 750 classic and rare instruments and 450 players, original ads, and memorabilia. 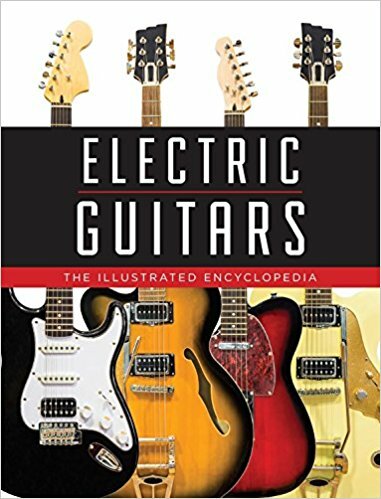 There’s also a 12-page bit at the front rounding up the pre-history of the guitar before anyone thought about plugging it in.